I love musicals and one of my favorite musicals of all-time is The Sound of Music. I've enjoyed see it over the years on television every time that it's shown. It's one of those films that just takes me away and lets me escape into another world. The songs are iconic and that opening scene of Maria (Julie Andrews) twirling around on the mountain and singing as the music swells just gets me every time. This year marks the 50th anniversary of The Sound of Music and I think that it's the perfect time to revisit the magic of this wonderful film. 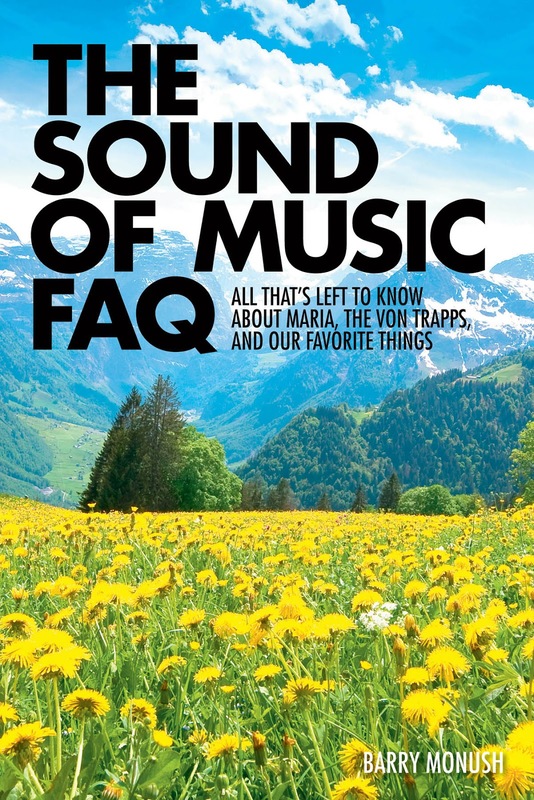 In the new book, The Sound of Music FAQ - All That's Left to Know About Maria, The Von Trapps, and Our Favorite Things by Barry Monush, readers are given a great resource in order to look at this iconic film in great detail. It's an encyclopedia-like reference that looks at the 1965 Oscar-winning film from many angles, such as examining the real Von Trapp family story and the original run as a Broadway musical. This wonderful book is chocked full of facts and trivia. An interesting element that I enjoyed was the charting of the original run in cinemas, a run which went on for an astoundingly long period of time. The Sound of Music became the highest grossing movie of the 1960s. You can tell that this fantastic book is a labor of love. The author Barry Monush writes a wonderful introduction that tells of his first time seeing the film in a theatre with his cousin, aunt, and sister in October 1965. He gives readers a glimpse of what began his love for the movie that continues to this day. The book is a good hefty 488 pages and is loaded with really intriguing facts that are wonderfully detailed and entertaining. The author has created a great guide for diehard fans of the movie, but I think that it's a fun read for any film buff or anyone who fondly remembers The Sound of Music. This book is a real treasure. The Sound of Music FAQ is available in the USA on Amazon here and on Amazon UK here.